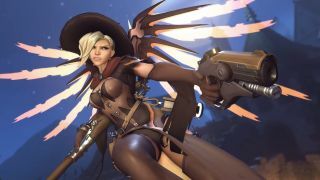 The Overwatch team has been gradually adding new modes to the game since the 2016 launch (yes, deathwatch is really going to happen!). But while Blizzard needs to put in the time and QA to carefully prep updates, enterprising players have been inventing their own modes. The latest clever creation we’ve stumbled on is a take on the zombie mode. Redditor ItsDeltin is responsible for this mode. It’s a riff on Halo’s Infection gameplay, where one team is zombies and the other is comprised of survivors. The zombies try to kill all the survivors, which switches them over to the zombie side. If any survivors are alive when time runs out, they win. Otherwise, the zombies take the day. ItsDeltin made a bot that could handle the complexities of the team-switching, which isn’t a function the regular custom game modes can do. It’s a little unclear if this bot falls in line with Blizzard’s terms of service but PC players can have a crack at the mode on his server for as long as it’s running. Zombie mode isn’t the only custom game style dreamt up by dedicated players, and PC players aren’t the only ones with the great options. Here are a few other common game modes that you’ll find in the official game browser on all platforms in case you want a fresh twist on the Overwatch experience. Mercy’s Resurrect ability is one of the most powerful ultimates in the game, and this mode will have you cursing the Swiss medic more than usual. It’s an asymmetric multiplayer event, where one supercharged Mercy and some AI bots takes on a whole team of human players. It’s similar to the official Junkenstein’s Revenge Halloween event, except you’ll hear “Helden sterben nicht” a whole lot more. “One shot, one kill” might be Widowmaker’s voice line, but the concept can be applied to any set of heroes. Most frequently, Ana has been the subject of this elimination mode. With reduced health pools, any shot with her Biotic Rifle is an instant kill. Whether or not the admin chooses to allow Biotic Grenades adds extra flavor to the experience. Blizzard probably didn’t have the Predator in mind when they designed Sombra, but it’s uncanny how similar they are with just a few in-game tweaks. Predator modes pit a buffed-up Sombra - think faster movement, more health, and shorter cooldowns - against three players on Soldier: 76. All the Soldiers need to do is stay alive. When your Sombra is good, that’s much harder to do than you might think. Remember that custom games do give admins a lot of control over rules, but it’s also on the players to abide by them. Honor the description for any server you join so a good time can be had by all.